Fast Buck Lucky is an all new instant scratch card game that is new to the world of Wizard Slots but is already proving very popular. Founded in 1996, Net Entertainment has taken the online gaming world by storm, becoming one of the world’s most successful online casino operators. With unique, premium experiences, NetEnt have many award-winning games, all with their own look and feel. Having won Slot Provider of the Year, Innovation in Mobile and Mobile Supplier of the Year at ERG 2015, it is safe to assume that this developer is doing their job well in the online slot market. Their passion for online gaming is reflected in their huge number of awards over a twenty year period, and the fact that they now serve over 170 of the world’s most prominent online casino operators. You can read more about NetEnt here. 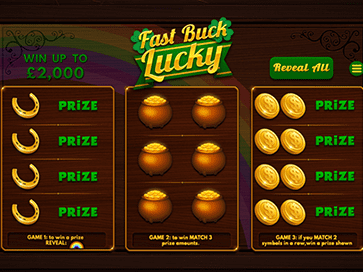 With a theme that is not unusual for online scratch card based games, Fast Buck Lucky brings the luck of the Irish into play with a backdrop of the end of the rainbow – will you find the pot of gold at the end if you are lucky? The cards use horseshoes, gold coins and pots of gold to entice you into the luck of the game, and the digital art is vibrant and inviting, looking like a wooden board – after all, as the saying goes, touch wood for luck! The graphics when playing each game look realistic and professional, letting you win big in style. The game itself offers 3 different ways of winning, and 9 chances to win per turn! Which way will you win? If it is with game 1… well, there are two more games you have a chance to win too. You might otherwise win on game 3, which is always a thrill on the last turn. Or if the luck is not with you today, you will definitely want to try Fast Buck Lucky again later, it only takes a minute but is simple and fun. Game 1 is easy – just reveal a rainbow to win. Game 2 requires you to match 3 prize amounts to win the cash. Game 3 also varies it up, and allows you to win a prize if you match two symbols in a row. At the end of the game your outcome will be summarised, so you know exactly what your winnings are – and you can boast to your friends if you have been lucky of course. The ‘play again’ button makes it easy to run the same stake through again, without having to reload the game. You will be sure to be entertained by this nicely made scratch card game, a popular choice from the amazing game developer NetEnt. The name describes the slot well – it is a fast paced game, and if you are lucky you make a quick buck! All three games bring something different to the table, making it nicely varied and a welcome change from many classic scratch cards. Scratch cards themselves are becoming increasingly popular online, and Fast Buck Lucky fits well into this market. It is quick, and despite three individual games, the rules are easy to understand. It really makes you want to try your luck out today.